When Afghanistan refugees pass the mountainous border to Pakistan they get their irises scanned by UN officials. Asylum seekers in Europe mutilate the tips of their fingers for not being identified via the Eurodac, a database of the fingerprints of all asylum seekers of the EU. More and more European countries introduce passports with RFID chips containing biometric data of their citizens. It seems that the body becomes the primary source for the technological verification of identities in the 21st century and the border becomes “part of the embodied identity of certain groups of people, verifiable at any of the many points of access to increasingly interconnected databases“ (Van der Ploeg 2005: 133). These are only some examples of manifolded discourses and practices within the context of new ‘security architectures’ with its social sorting, policing, militarization and re-masculinization of society. These systems get increasingly enlarged – legitimized with security issues during the ongoing western ‘wars on terror’. Astonishingly, there is only little discussion on new ‘security’ resp. surveillance technologies with their practices been deeply inscribed into our everyday life. 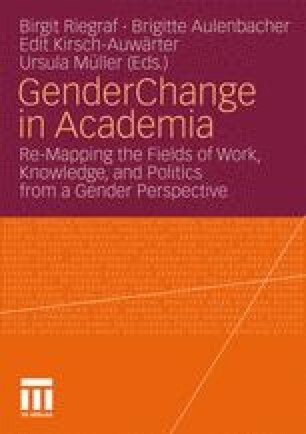 In my opinion these issues are main challenges of feminist and other critical technoscience studies today.